"We are very pleased to work with LifeHealthcare to bring Renaissance to Australia"
RoboEarth Cloud Engine the team continues their work towards creating an Internet for robots. Applied Robotics' SmartComm™ for the Sigma line of Tool Changers takes Communications information in the plant to a higher level as the only Communications Module on the market to offer Diagnostics and support many major industrial buses including; DeviceNet, Ethernet IP, Profibus, CC-Link, Profinet, etc. Applied Robotics' Sigma NextGen™ is the latest in the Established line of Sigma Tool Changers, Designed to keep Pace with Industry Demands. Vanguard Defense Industries is a recognized leader in the unmanned vehicle industry. FANUC Robotics' CERT program certifies instructors at educational institutions to train their students to program FANUC robots through on-line and hands-on training courses. Motion control products distributor Highland Controls today released an expanded version of its web site with more products and free tips. The goal of the research is to enable small robotic platforms - that would be used by individual soldiers - to remotely perform surveillance within complex urban environments and terrain. 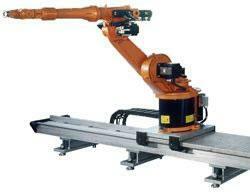 03/07/13, 08:45 AM | Industrial Robotics | SICK, Inc.